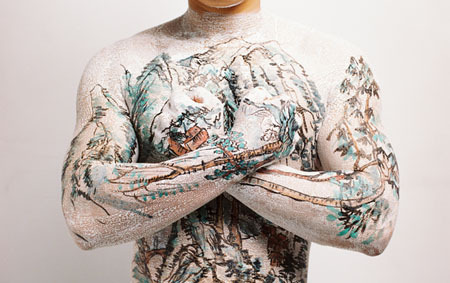 [Image: Landscape on skin, by Huang Yan, from the East Link Gallery, Shanghai; via The Economist. Now we just need someone covered in architectural diagrams, or sea charts... maps of faultlines... stars...]. Oh, how I've been waiting for BLDGBLOG to go there. Finally. Nearly absolutely related: Bacterial 'Zoo' Thrives on Human Skin. Which shouldn't surprise anyone. But this is interesting: "Just as each person is unique, so too is his or her bacteria, the researchers found. More than 71 percent of all species identified were unique to just one of the six test subjects. Three species were only found on the men's skin, suggesting that some bacteria exclusively live on men or women." And: "As adults we have 10 times more microbial cells than human cells, and perhaps 100 times more genes embedded in the genomes of our microbial partners than in our own human genome." So we're like walking miniature Amazons or Chinese karst landscapes, pristine or otherwise. A walking gene pool that we might be unknowingly dipping ourself into for foreign DNA strands to fold back into our own. How about having multiple people get fullbody tattoos of different information from the same landscape? A family wherein one parent is a topo map, the other a hydrological diagram, and the kids are faultlines, utilities, real estate assessor's maps, etc? This zoo of bacteria, Alex, where are the cages and the keepers, the tourists and the docents. What species are they and what do they charge to "get in." With a wild whimsiness, he now used his coffin for a sea- chest; and emptying into it his canvas bag of clothes, set them in order there. Many spare hours he spent, in carving the lid with all manner of grotesque figures and drawings; and it seemed that hereby he was striving, in his rude way, to copy parts of the twisted tattooing on his body. And this tattooing, had been the work of a departed prophet and seer of his island, who, by those hieroglyphic marks, had written out on his body a complete theory of the heavens and the earth, and a mystical treatise on the art of attaining truth; so that Queequeg in his own proper person was a riddle to unfold; a wondrous work in one volume; but whose mysteries not even himself could read, though his own live heart beat against them; and these mysteries were therefore destined in the end to moulder away with the living parchment whereon they were inscribed, and so be unsolved to the last. And this thought it must have been which suggested to Ahab that wild exclamation of his, when one morning turning away from surveying poor Queequeg - "Oh, devilish tantalization of the gods!" I've always wanted to have a map of the Netherlands tattooed on my ... Netherlands. The artist first tattooed a map of China onto his back, and then would tattoo each new site that the Long March team would arrive at in its respective position on the map, permanently leaving behind each route and site. he was walking as part of works that were realized throughout the course of the "Long March - A Walking Visual Display." I'm curious if the guy stops lifting weights and gets fat. Or if he has an accident. Or if he has a mole removed for dermatological analysis. Could these or other such long-term changes be aesthetically incorporated into the image on his skin - say, a growing mountain (ahem), or the swelling waters of a mountain lake (he gets a beer belly)...?